Stiff and sore from hours parked in front of your desk at work? You’re not alone. 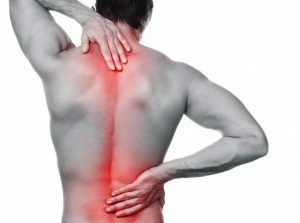 Figures suggest that up to 56% of office workers experience low back and upper back pain at any one time. And this doesn’t take into consideration those who might also be suffering with neck pain, shoulder pain and wrist pain. If you can, alternate between sitting and standing every 30 minutes. This may mean the use of a sit-to-stand workstation. Apart from pain, prolonged sitting has been shown to be linked to many serious health conditions such as heart disease, type 2 diabetes and various types of cancer. As a general rule of thumb, for every 30 minutes you spend sitting, you should spend 30 seconds moving. This could be as simple as getting up to get a drink or standing up when you take phone calls. A few simple stretches will help to keep your muscles and joints mobile. Download the free exercise programs below. Results from a recent study on the effects of a strengthening program on neck pain found that a simple workplace-based strengthening program was effective in reducing neck pain in office workers who had current neck pain. Programs targeted towards strengthening of the neck and shoulder yielded superior results to those targeting general fitness.